We are super-excited to introduce a wonderful artist to the Finding My Way OM family and also to host our very first giveaway! (Keep reading below for the 15% off discount and the giveaway contest). Lindsay Satchell combines her artistic talent with her love of yoga to bring a unique style to her work. Her Etsy store (www.lindsaysatchell.etsy.com) showcases her watercolor and ink pieces. Lindsay describes her watercolor process: "I let the watercolor flow, blend and move as it wants... then shape the body with ink lines. For my process, it's important to me to let the materials show, not hiding or covering any natural characteristics or imperfections." Lindsay is also trained in sculpture. Her sculpture work is is done in metal and wood and she loves to create jewelry and small works of art. If you're looking for any type of custom commissioned work, please contact Lindsay. She has worked with yoga studios, created designs for meditation/yoga workshop fliers, original pilates paintings, original artwork for cards, large-scale paintings for a fitness center and even small works for tattoos! She also licenses her existing work for those who want an affordable logo or brand identity. Lindsay is generously offering our readers 15% off any print in her shop. Please visit Lindsay's Etsy store today and enter "FindingMyWayOM"at checkout to receive this discount. 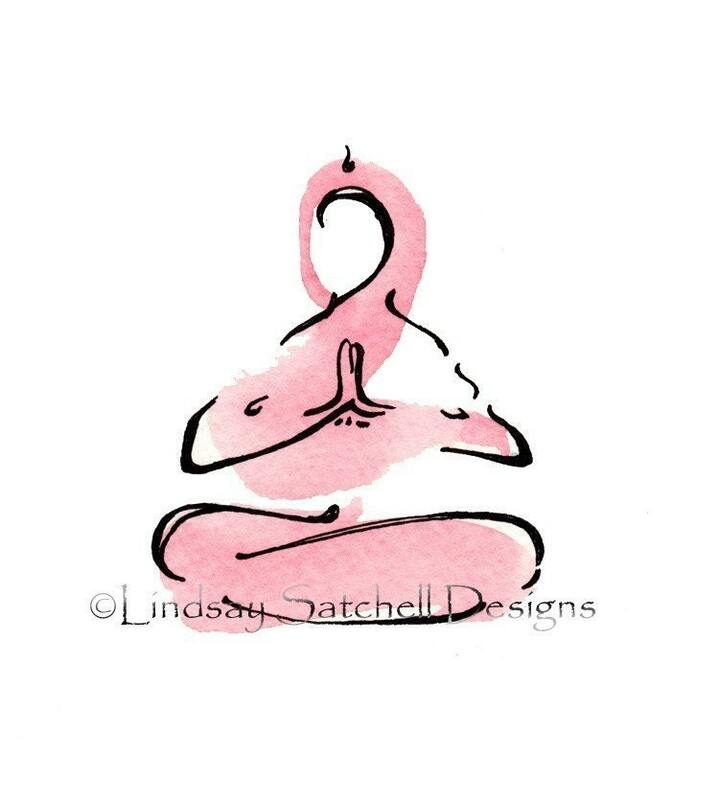 Lindsay has also generously donated an 8 1/2" x 11" signed print, which is a reproduction of her original watercolor painting of "Easy Pose" (Sukhasana) as well as a protective packet filled with 4 notecards showing her most popular yoga prints. These images are printed in gorgeous color on smooth, sturdy cardstock. Cards are 4" x 5.5"
PRIZE: BOTH THE PRINT AND THE PACKET OF CARDS TO ONE WINNER! If you are already following us by GFC then just leave a comment with your email and let me know that. This contest will end at 11:59pm on Saturday 12/3/11. Winner will be chosen at random by random.org or by 3rd party of FindingMyWayOm.com's choosing. Beautiful! Good luck to all! I already follow you on Facebook... And subscribe to your e-mail... Do I post my e-mail address here? How great that you are promoting these watercolors. I really like her mother and child pieces on etsy, too. Nice work! I would so love to win this to give as a gift to my friend who is a yoga teacher. This giveaway has ended. Winner will be drawn Sunday 12/5/11. Thanks to all who entered. I'm your new biggest fan!